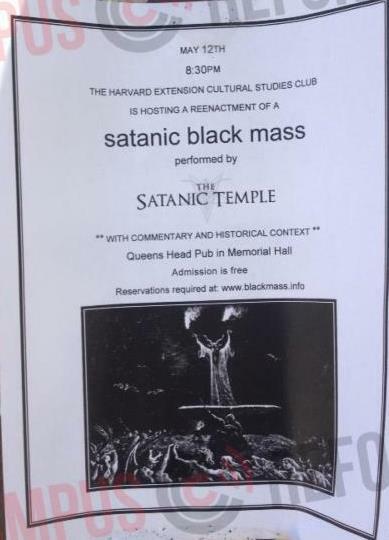 Harvard University – one of America’s most elite institutions – will host the reenactment of a Satanic Black Mass on May 12th. 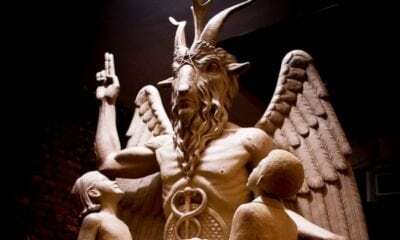 The event will be conducted by the Satanic Temple whose representatives will provide narration on the academic and historical aspects of a Satanic Mass. Flyer advertising the Black Mass. The image is of Baphomet standing on an altar surrounded by damned souls. “Animal masks seem to have been a popular form of disguise adopted by the witches and wizards attending meetings, and this custom is probably responsible for many of the stories of witch lycanthropy. The “reenactment” presented at Harvard will however be a “PR-friendly” version of a Black Mass and will probably be presented as a “theatrical response to the Church’s oppression”. This is the classic angle to make these practices “hip” and socially acceptable. The Mass will take place at The Queen’s Head Pub, in Memorial Hall, which is at “the heart of Harvard’s campus”. The Hall was “dedicated in 1878 as a monument to Harvard alumni who died during the Civil War” … odd place to conduct a Black Mass. 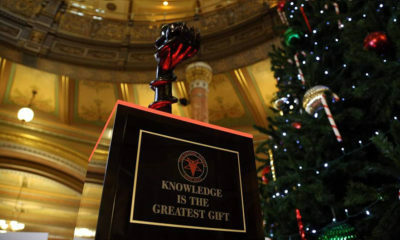 As I noted in this article, the Satanic Temple is also hard at work to get a statue of Baphomet placed at the Oklahoma State Capitol (or any other high-profile location to get publicity). Here’s what the statue will look like. 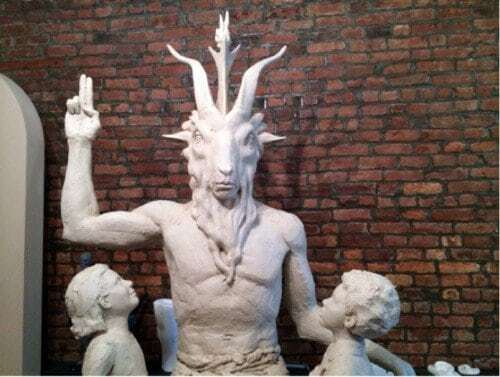 Although the Satanic Temple claims that “it does not believe in the supernatural”, its statue features Baphomet doing the hermetic hand sign “as above so below”. It will site in front of an inverted pentagram, the symbol of black magick. 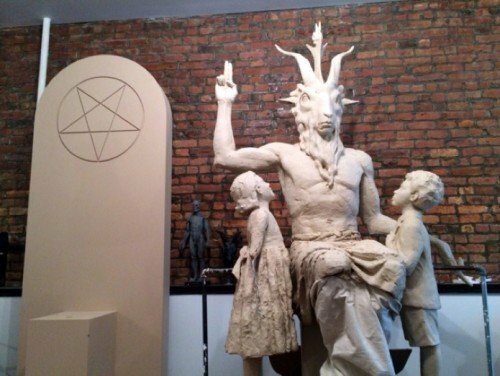 The goal of the Satanic Temple: Luring children into looking up to Baphomet (and everything it represents) by claiming that it’s merely a “harmless poke at Christianity”. No one find eating and drinking the blood of Christ odd in the Catholic Church. Sorry, but there's no place more 'devilish' than the Catholic Church, responsible for the Inquisition, the burning and deaths of millions of heretics and 'witches,' a vast accumulation of wealth, and rampant pedophilia. "Ἀμὴν ἀμὴν λέγω ὑμῖν, ἐὰν μὴ φάγητε τὴν σάρκα τοῦ Υἱοῦ τοῦ ἀνθρώπου καὶ πίητε αὐτοῦ τὸ αἷμα, οὐκ ἔχετε ζωὴν ἐν ἑαυτοῖς. ὁ τρώγων μου τὴν σάρκα καὶ πίνων μου τὸ αἷμα ἔχει ζωὴν αἰώνιον, κἀγὼ ἀναστήσω αὐτὸν τῇ ἐσχάτῃ ἡμέρᾳ. ἡ γὰρ σάρξ μου ἀληθής ἐστιν βρῶσις, καὶ τὸ αἷμά μου ἀληθής ἐστιν πόσις." "Verily, verily, I say unto you, Except ye eat the flesh of the Son of man, and drink his blood, ye have no life in you. Whoso eateth my flesh, and drinketh my blood, hath eternal life; and I will raise him up at the last day. For my flesh is meat indeed, and my blood is drink indeed." John 6:53-55 Clearly Christ expects his disciples to eat his flesh and drink his blood. You are also clearly ignorant of history with your comments (fed to you by the same people who control media etc. i.e. the Illuminati). The Church is "the pillar and ground of the truth." (1 Timothy 3:15). Clearly you take for truth what word is given to you by means of popular litterature. Truely, the double tt's were a typo. People need to start protesting against this kind of stuff. Why don't we make more noise? Like desecrating satanic temples and statues, for instance. Hmmm. Harvard also just honored former Pres., George Bush Sr., the rumored Luciferian. Man has he gotten old and ugly! 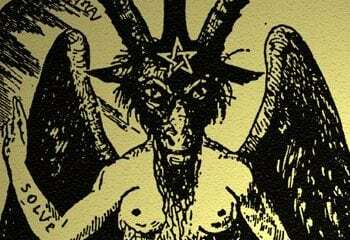 Among the greatest sins of most practicing Satanists is that they pretend to be lovers of God. The apostate Catholic church is the most powerful of these. Many Protestant denominations do the same. They think they can defeat God, but they shall fail. It was cancelled because of outrage by the people against the event. You still have the power! Without paganism there would be no christianity.If anyone really took the time to study the occult they would know that like most things it is just a reflection of the practicIoner.Whats funny is the Catholic church with its stances on war,child molestation are just as "satanic" as its inverse.I mention this so people take note how evil practitioners play both sides of yin and yang.To shock the mind. Yep, very little actual evidence of Satanic abuse but an incredible amount of Christian abuse evidence. Ummm nope. The title/religion "Christianity" shouldn't be confused with the belief that Yeshua is Christ. it didn't take pagan worship for folk to believe in Yeshua… o_O. Those who were sent to abolish pure Christian values came up with this Sun worship .. The word is what God wants so it's not necessarily "religious" it's more of a confirmed faith. It's authentic. It's relationship. Not some watery idea a group of people do together because they want to look good. It's necessity and substance ..it's life… It's all that is good! Try it! "Without paganism there would be no christianity.If anyone really took the time to study the occult they would know that like most things it is just a reflection of the practicIoner.Whats funny is the Catholic church with its stances on war,child molestation are just as "satanic" as its inverse.I mention this so people take note how evil practitioners play both sides of yin and yang.To shock the mind. " That's actually very well said. 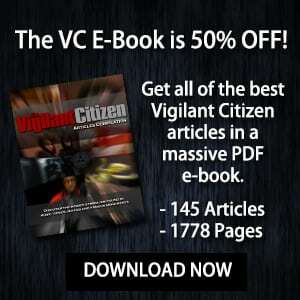 Libertarians have long known how "legitimate governments" are really nothing more than glorified crime syndicates. Taxes, for example, are really nothing more than protection money. By the exact same token the "established religions" are nothing more than glorified satanic cults. The only real difference is the former are socially accepted, the latter are not. There was such an outpouring of protest via petitions to stop the satanic black mass that it was stopped. Praise God! Such bullsh*t! Their excuse of "doing this as a harmless poke at Christianity" would have stood much better with me if instead they'd make a rendition dedicated to like… The Spagetti Monster, or anything like that. This truly makes me feel uneasy towards our future. This ritual would only have power over you if you think it does. It's time to abandon mythos in favor of logos. As a species we need to seek and understand idealism. Empirical materialism has been in the driver's seat too long and done us no good. I look at this event as a complete farce to be disregarded. It must be stopped if it harms anyone however, I am not suggesting we turn our backs on evil actions. Harvard is such a great school isn't it? (Sarcasm) Why is there so much hype around Harvard, anyway? Their problem is they think they are God (gravity). Yet they haven't created S--T.
Truth is, has always been, will always be the opposite: God (gravity) is us. Satanists are the biggest, most hopeless SLAVES, because they think they are the most free. Must admit, I thought the choice of date seemed more than coincidental. What we now call May 12th is actually pre-Gregorian calendar May Day, now known as Old May Day. Before the calendar was adjusted that specific day would have actually corresponded to May 1st when Beltane was celebrated. It was canceled. I actually prayed immediately after reading this that this would be canceled. THANK YOU, LORD. Well done, we all participated through our consciousness. That is the only way we will change the world. It wasnt canceled it was moved. But still the fact that the school even thought about hosting is sickening. It only closed its doors to the mass of backlash ( thank God). Otherwise it would have still hosted there at horrorvard. I read that it was canceled because they couldn't find another willing venue to host…. Oh great a chance to learn about another religion gets canceled -go figure. When they host the nativity scene i will protest. If one religious event gets canceled -they all get canceled, fair is fair. In all fairness, there are plenty of places to learn about satanism already. As VC often points out, it's all around us. Im talking about the history of satanist why the founders started it what are their principles? Are they tolerant of other religions -stuff like,thats what i want to learn. Symbols are just the small part of a whole. If i have to listen about the creation of mankind all the way to the ressurrection of jesus christ more than i hear anything about any other religion, which is not fair the average person could tell you about the birth of jesus than the birth of buddha. Christians always get respresented and when another religion tries to have their viewpoint come across christians cried out and tgen other religious events get shutdown thanks to christians but no more im tired of everything being one sided. If any christian events start happening like the black mass event i will protest. It sounds like you live in an area dominated by Christians, and it's making you bitter. Sorry you feel that way. I suppose too much of anything can be negative if it is forced on someone. Nobody wants to be preached to. Perhaps one day you can move to a city or country with more ethnic and religious diversity, so you don't feel so overwhelmed by one faith. Best of luck. I'm a Boston resident and I just read that they moved the location of the Mass to a nearby bar in Cambridge due to the negative outpouring of this event (particulary from the Archidiocese of Boston, who scheduled a "holy hour" for the same time). I'm totally against this garbage but not shocked this hasn't gotten more media coverage. I haven't heard one thing about it on the news, except for a little blurb in the Metro… surprised? No I am not surprised. The media is owned by the same Satanic worshipers who continue the cover up the Satanic sacrifice that took place on 9/11/01. Of course they won't call attention to this event, especially since it was defeated for the time being. Honey you should be worried about your soul,all these wars and torments and diseases and enslavement are all FOR A SHORT TIME,it is going to end but where ur soul goes to stay,is FOREVER,ETERNITY IS FOREVER…so,you should be VERY worried for your soul…..
Honey, my soul is just fine & right where I want it to be, thank you. 🙂 No need to presume otherwise. My point: Whether or not someone believes in magic and/or religion, this sh** (war, sickness, dodgy environment, financial strife) IS ACTUALLY HAPPENING to people. It may be "temporary," as you say, but that doesn't make it right. 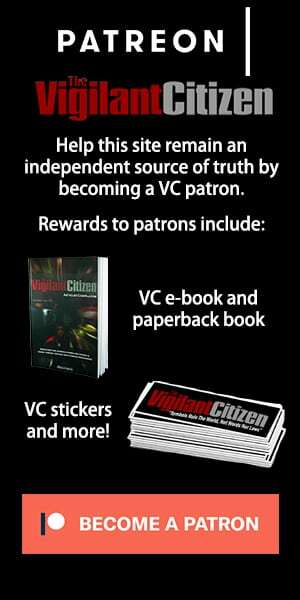 Supernatural or not, the nefarious actions of TPTB affect ALL of us on a very REAL and personal level. We can't forget that. I think this post has opened up a lot of interesting and important dialogue and conversation, and I'm glad for that. But it's not good to get too consumed with arguing semantics and theology, because it only goes in circles and becomes a distraction from dealing with the issues in front of us. Whatever goes on in the cosmos between good/evil, light/dark, god/satan, the fact remains that WE must take care of each other here on Earth. Maybe the perspective needs to be changed to: "As below, so above." Richard….you are not the grand chancellor of reality. Therefore it's important to not speak as though you have the answers to life's enigmatic questions. But it is important to think and reason. And to question. Thank God it was cancelled indefinitely…..
Due to popular resistance, the event has just been called off. It's canceled.